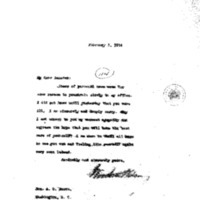 Woodrow Wilson writes to Augustus O. Bacon regarding Bacon's recent ill health. Items of personal news seem for some reason to penetrate slowly to my office. I did not know until yesterday that you were ill. I am sincerely and deeply sorry. May I not convey to you my utmost sympathy and express the hope that you will take the best care of yourself? I am sure we shall all hope to see you out and feeling like yourself again very soon indeed. Wilson, Woodrow, 1856-1924, “Woodrow Wilson to Augustus Octavius Bacon,” 1914 February 5, WWP18335, First Year Wilson Papers, Woodrow Wilson Presidential Library & Museum, Staunton, Virginia.